Google launched an interesting experiment this week, offering free “super” wi-fi connection to the Internet for several schools in Cape Town South Africa. What is interesting about that you might ask? Well they are using the unused frequencies in the broadcast TV spectrum. 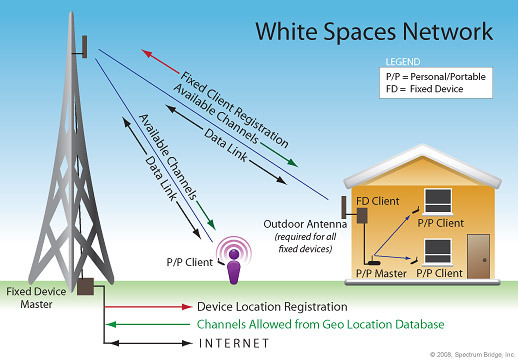 The TV broadcasting frequency spectrum is currently divided between many channels, but between each channel there is a gap, a frequency space, often known as “white space’, and the hope is that this space can be used to broadcast high speed wireless Internet access. This experimental system is not without it doubters though, TV companies are not keen because they think there might be interference in their picture, so what better than a small experiment to try it out? We can all imagine how this experiment might revolutionize Internet use though. In the countryside where infrastructure is lacking but TV is visible the companies could offer a service. In the city where cables are all in use they could do the same. One great advantage is that low frequency signals can travel over long distances, so the coverage potential is massive, and they penetrate buildings and other natural barriers much more efficiently than other frequencies currently in use. Here in the US many telecommunications carriers have been complaining that there is not enough bandwidth for them to keep up with consumer demand, and so the Federal Communications Commission has been trying to free up spectrum space. They approved rules in 2010 about the use of such white spaces and databases have been set up to monitor spectrum use to see how it can be improved. Google are one of the leaders in this database organization too, as this article explains. Experiments are being conducted here too, with this article describing how the system is being used in a small North Carolina town, and results reported in the UK claim that the system can deliver 16 megabits per second over 10KM (see Christopher’s comments on this related article for an explanation of what that means), but this is a delivery similar to what we know as 4G. Potentially great improvements in coverage might be just round the corner through a more efficient use of an already existing infrastructure.